Adapting to the ever-changing needs of family businesses is a full-time job. While many of the basic needs stay the same, studies have shown that the need for outside knowledge and advisors has never been greater. As the director of a university-based family business center, I rely heavily on outside advisors to be an additional resource to the families we serve. Although the family firms with whom I interact on a daily basis are wise and sophisticated enough to find their own advisors, there is a role for a well-respected business school to advise families on choosing the right professionals for their companies. One of the things we do at Cal State University Fullerton (CSUF) is to encourage the service providers who are part of our program to attend our monthly meetings and be accessible for periodic free advice to our family enterprise members. We also give each service provider one workshop every 18 months to come in and present a topic relevant to our family-owned companies. The model we use at the Center for Family Business at CSUF is to have five exclusive service providers as part of our cadre of experts. We keep these partnerships exclusive for a number of reasons – one of which is that it keeps our monthly meetings focused on the family businesses in the room and keeps the networking element out of our events. Our focus is to create an environment for our members that is safe, confidential, and educational. To do this we have several Peer Affinity Groups (PAGs) and recently launched what we are calling a SPAG (Service Provider Affinity Group). I meet with our five exclusive sponsors every other month with the single focus of creating a stronger and more united team of trusted advisors for all of the clients of the SPAG, and not just the members of our Center for Family Business. Our SPAG is focused on working with family businesses in the region and is developing a reputation as a group of experts who are becoming trusted advisors to these family business leaders. Our family business clients have had success because they know their business, their customers, their industry, and have established values and procedures that work. However, there comes a time for most people and companies when they realize that reaching out to others may be the best way to gain the knowledge and expertise that they lack. Consequently, our SPAG frequently suggests that family businesses consider finding resources outside the family to assist in the leadership of the company. This doesn’t necessarily mean that they should bring in a non-family CEO, but they should be willing and open to bringing in someone from the outside to work in key positions where family members themselves may not have the right education and experience. The most successful family businesses in the world have a lot in common, but a consistent feature of every world-class family business is that it knows that it does not know everything and that there is experience out there beyond the family that can make a tremendous impact on the business. This is where we, as advisors, come in. Most of us in the SPAG have worked with hundreds of family businesses, so we have seen a variety of situations that are often similar to what our clients are facing. So often, family companies are not even aware that there are others out there facing the same pain or issues. This is a sentiment that we all hear on a regular basis. When a family business leader recognizes that he or she does not have all the answers and sees that there are experts who spend all of their professional hours focused on assisting them now and into the future, it brings peace to these families. So many, like Ms. Buss, have told me over the years that they feel a reassurance knowing that they can turn to a variety of experts who can help them through difficult and seemingly impossible situations. Ed Hart is the director of the Center for Family Business at Cal State Fullerton. He can be reached at [email protected]. 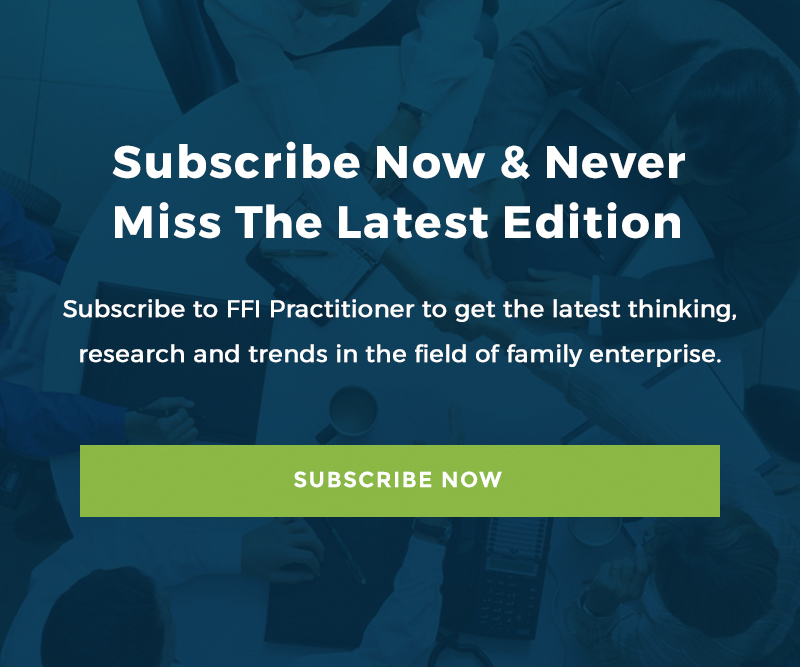 Editor’s note: The FFI website lists 145 family enterprise programs worldwide. These range from programs similar to the one at CSUF to research-based programs, to graduate and undergraduate programs as well as individual courses on family enterprise topics in executive education or continuing education programs. Go here for more details and ideas on how these programs can help your clients as well as improving your own professional education.